The edgy, Electronic experiments of MIN t — Omni. Another month and another Basement Bash (vol. IX) has come to pass. This time, the one year anniversary of the infamous, Indie event in Berlin. The Marie-Antoinette bar, for those who haven't read my previous blog on Basement Bash, is close to Jannowitzbrücke and is hidden behind the main BVG headquarters in a small alleyway. On Friday 23rd February, it was packed with drinks and laughter all round.... and what an incredible line-up! The first act was Magnea, who's performance was just awe-inspiring, she appeared ethereal and fluid, accompanied by a half-naked, fluid, male dancer who remained motionless for a lot of the songs in order to be the canvas of her amazing light projections. Banglist was next, a BIMM band with cool, punk-rock vibes and a strong, independent woman vibe (I hope to review this band more in-depth in the near future, their song Sister truly made some audience members cry and was incredibly powerful). Magnea and her light projections. Banglist performing their song Sister. The main focus of this blog post, however, is the female, experimental singer, producer and composer, MIN t. I'd heard many things about MIN t before arriving from some of the other BIMM students in awe of her, I'd been shown a few songs on her album and been really fascinated at the range of experimental sounds created and the extensive range of genres she layers into her work, ranging from delicate and light jazz qualities and neo-soul to a more violent and up-beat punky feel with rap and r'n'b beats. Martyna Kubicz, the force that is MIN t, originally comes from Wrocław in Poland and has apparently gained notoriety in varying cities in Poland as well as Berlin, where she is now studying as a BIMM student. According to her Facebook, she started her solo career four years ago, and, having spoken to many BIMM students, started off with very little technology and Ableton compared to her magnificent performance with multiple electronic components that she's evidently built up. Seeing her live was incredible and her set-up was immense. 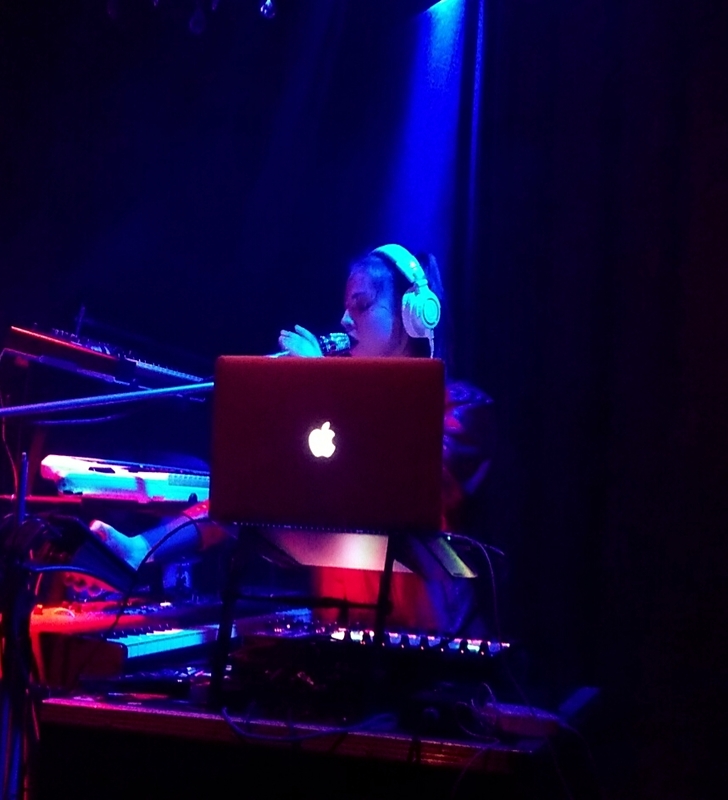 With an Apple Mac, various keyboards, loopers, a synthesizer and a microphone, she appeared on stage with an edgy, red, slightly puffed out jacket, a ponytail and big white headphones that she just completely seemed immersed in as she built multiple layers, moving her hands with speed and precision between all her music makers. MIN t incorporated a live drummer into her work, Raffael Brunner, who grounded some of the electronic tunes and MIN t's ever-changing, layered voice and added a more traditional aspect to her experimental pieces, but the drummer himself has to be merited for his insane energy and breadth of beat that really added some quality depth to each song. She altered her voice many times too; ranging from looping her own vocal range; a wonderfully aggressive, punky shouting and rapping (like her song Her Story); a slightly monotone and semi-robotic voice to fit in with her crazy, varying sounds; sometimes she used effects that made her sound far-away, echoing, disfigured and other multiple alterations. Her electronic beats have so many variants as well. Missing the Air was one of my favourite tunes because of this, making guitar sounds sound extremely distorted and alien, with other experimental elements, a steady build-up and a consistent bass beat creating something deep, mysterious and sensual. The effect of MIN t live is intense: sometimes psychedelic, some occasional, hard-core, rocking guitar riffs, deep and slow r'n'b beats, electric and semi-techno repetitions and always done with a gorgeous and varying voice. There are even some slightly 80's synth sounds like in her song Down/On, that builds upon this with high-energy drums and a consistent beat. Basing her inspirations on artists such as Moloko, Kaitlyn Aurelia Smith, Autechre, M.I.A and Prince, as well as some classical inspirations like Debussy and Szymanowski. The audience really danced and bounced to all of her tunes and their varying consistencies and she was raved about both before and afterwards which just shows the extent of her gaining notoriety.